Here you have only a glimpse of relativity — the glimpse needed to understand string theory. This article explains how the ether model failed to match experimental results and how Einstein introduced special relativity to resolve the problem. In the latter part of the 19th century, physicists were searching for the mysterious ether — the medium they believed existed for light waves to wave through. Their inability to discover this ether, despite good experiments, was frustrating, to say the least. Their failure paved the way for Einstein’s explanation, in the form of the theory of relativity. Waves had to pass through a medium, a substance that actually did the waving. Light waves pass through “empty space” of a vacuum (a space without any air or other regular matter), so physicists had predicted a luminous ether that must exist everywhere and be some sort of substance that scientists had never before encountered. Some things could be predicted about the ether, though. For example, if there was a medium for light, the light was moving through it, like a swimmer moving through the water. And, like a swimmer, the light should travel slightly faster when going in the same direction as the water’s current than when the swimmer is trying to go against the water’s current. This doesn’t mean that the ether itself was moving. Even if the ether was completely still, Earth was moving within the ether, which is effectively the same thing. If you walk through a still body of water, it feels basically the same as if you were walking in place and the water was flowing around you. Physicists wanted to construct an experiment based on this concept that would test whether light traveled different speeds in different directions. This sort of variation would support the idea that light was traveling through an ether medium. In 1881, physicist Albert Michelson created a device called an interferometer designed to do just that. With the help of his colleague Edward Morley, he improved the design and precision of the device in 1887. The Michelson-Morley interferometer is shown in the figure. The interferometer used mirrors that were only partially reflective, so they let half the light pass through and reflected half the light. 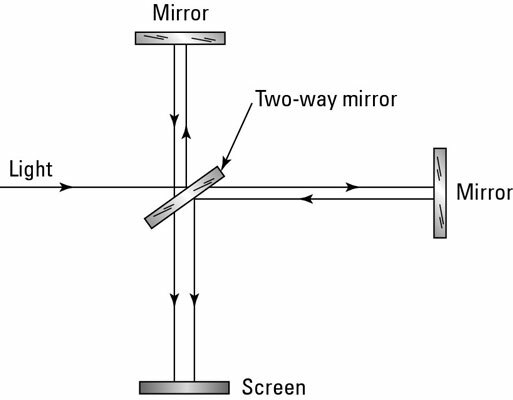 The interferometer set these mirrors at an angle, splitting a single beam of light so it ended up traveling two different paths. The paths traveled perpendicular to each other, but ended up hitting the same screen. In 1887, Michelson and Morley ran a series of tests with the improved interferometer to discover the ether. They thought that the light traveling along one of these paths should be slightly faster than the light traveling along the other path, because one of them would be going either with or against the ether, and the other path would be perpendicular to the ether. When the light hit the screen, each beam would have traveled the exact same distance. If one had traveled a slightly different speed, the two beams would be slightly out of phase with each other, which would show distinctive wave interference patterns — light and dark bands would appear — on the screen. No matter how many times Michelson and Morley conducted the experiment, they never found this difference in speed for the two light beams. They always found the same speed of approximately 670 million miles per hour, regardless of the direction the light traveled. Physicists didn’t immediately dismiss the ether model; instead they (including Michelson and Morley) considered it a failed experiment, even though it should have worked had there been an ether. In 1900, when Lord Kelvin gave his “two dark clouds” speech, 13 years had passed without being able to detect the ether’s motion, but it was still assumed that the ether existed. Sometimes scientists are reluctant to give up on a theory that they’ve devoted years to, even if the evidence turns against them — something that the critics of string theory believe may be happening right now in the theoretical physics community.